Now the best selling handheld computer game is interactive! Play by yourself or against an opponent. 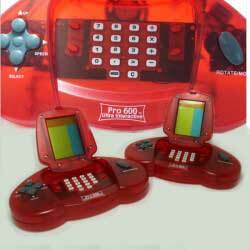 You will be entertained for hours with the Pro 600 2-player hand held video game system. It includes 59 games: each has 19 levels and 10 speeds – giving you over 11,000 ways to play! A mute mode allows for sound-free play, making this a great game for travel. Also features a calculator, game pause, and auto power off functions. With thousands of ways to play, there’s always a new challenge. Ages 6 and up. <?xml:namespace prefix = o ns = "urn:schemas-microsoft-com:office:office" />59 different games – each has 19 levels and 10 different speeds! Games include: Tank War I, Tank War II, Ping Pong I, Ping Pong II, Rally I, Rally II, Car Racing I, Car Racing II, Honey Bee, Shooting, Filling, Snake I, Snake II – each with between 3 to 8 different versions. Play by yourself or attach the included wire to your friend’s game and play against each other! Most games are interactive and allow you to see how your opponent is doing. Volume control includes mute, low, medium and high.